Is your marketing team eager to try onsite retargeting for your eCommerce site, but your developers don’t have time to help implement your ideas? Is it cost-prohibitive to ask your developer to design and launch a popup offer every time you have a new offer or audience to target? In this case study, we’ll see how IncStores used onsite retargeting to more than triple their list, all without burdening their developers or budget. IncStores specializes in niche, specialty flooring. Their product lines include gym flooring, garage flooring and kids’ flooring. Before using OptinMonster, IncStores’ primary form of list building came from prospects requesting sample flooring orders. A few others each month subscribed through a tiny newsletter form in the footer of each website, but they admit the form didn’t even function properly. IncStore’s websites are managed by an in-house team of developers. Getting development time for correcting issues like these proved difficult. Even harder was getting development time for brand new marketing initiatives like popups or optins. Offering a subscription to prospects requesting flooring samples was an excellent way for IncStores to increase their list. However, it targeted only visitors near the end of the buying process. They wanted to connect with visitors earlier in the buying cycle, nurturing them into subscribers, customers and then fans. IncStores decided to try ecommerce retargeting using our exit-intent technology. Typical ecommerce retargeting shows an ad to visitors after they’ve left your site, typically through pay-per-click advertising. This can be effective when done correctly, but the costs add up very quickly. OptinMonster’s Onsite Retargeting® allows you to display an ad or offer to visitors at the precise moment they’re about to leave your site. Onsite retargeting allows you to convert those abandoning visitors BEFORE they ever leave your site, saving you money on third-party retargeting ads. The best way to capture those abandoning visitors is with an exit-intent optin. Exit-intent technology will track your visitor’s actions and detect the precise moment they’re about to leave your site. At that moment, your targeted campaign will display. IncStores started by adding an exit-intent optin to every page on flooringinc.com and rubberflooringinc.com. This optin captures hundreds of email addresses every month. It converts 2.05% of abandoning visitors who would have otherwise left and forgotten all about their site. Split testing lets you try different content, headlines, layouts, styles, and campaign triggers to see what works best for your audience. If you don’t split test, you’re missing out on leads and sales without even knowing it. Learn how (and why) you should create a split-test using OptinMonster’s built-in split-testing tool. 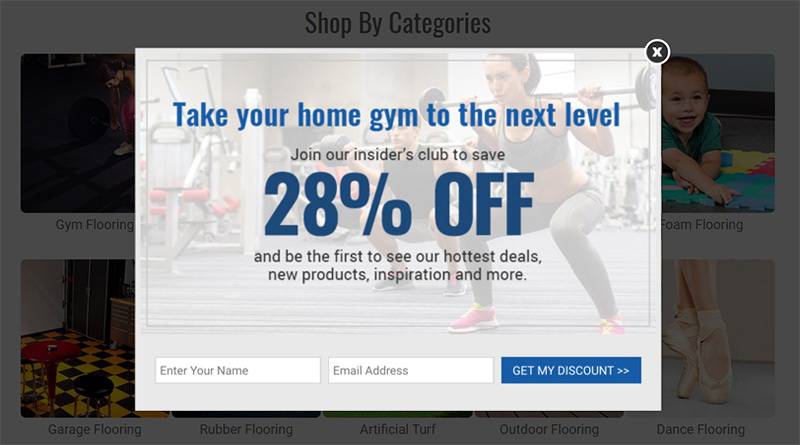 IncStores started split-testing optins on rubberflooringinc.com, their site selling gym floors. The first test was changing the headline of an exit-intent lightbox targeted to display on every page of the site. The headline in the primary optin reads, “Take your flooring to the next level.” It converts around 2.65% of visitors. The variation only converts 1.83%. Both optins are targeted to display on every page of the site. The primary optin’s headline is broad enough to match the content of any product category on the site. The variation, however, is more specific. For the person reading about artificial turf or dance school flooring, the variation about home gyms is irrelevant. This is probably why the variation didn’t perform as well as the primary optin in the test. Page-level targeting is a great strategy for further list growth moving forward. Segmenting your email subscribers based on interest also allows you to customize the email marketing campaigns they receive after subscribing. IncStores was able to easily achieve their goal of converting visitors into subscribers, customers and then fans, without having to wait on their development team. IncStores increased their weekly email signups from 250 to 750+. IncStores has grown their email list size by 300%. IncStores now converts 2.65% of abandoning visitors into subscribers and customers. Are you ready to split-test your way to a larger email list? Get started using OptinMonster today.